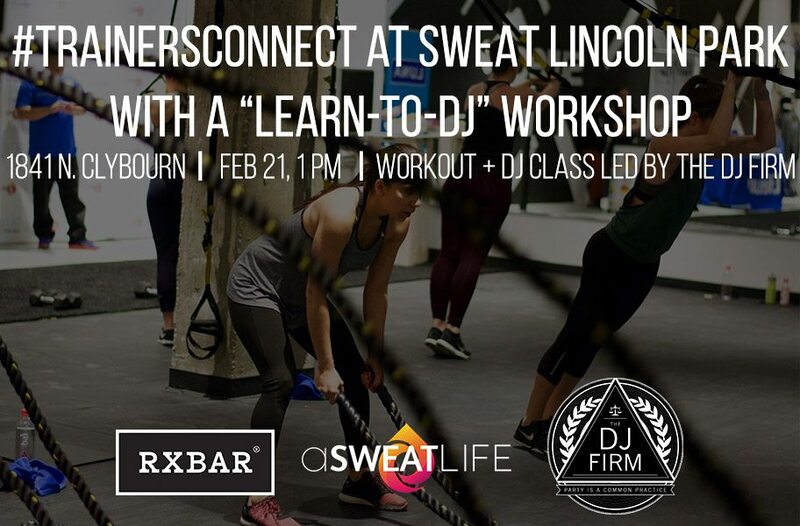 Join us at SWEAT’s newest studio in Lincoln Park for a sweaty, trainers-only workout led by Sweat’s owner, Paul Rahn. We’ll complement the workout with a music-mixing workshop led by The DJ Firm. After all, we all know that sometimes, it’s a playlist that makes or breaks a class. Hear from The DJ Firm what goes into crafting the perfect playlist, where to find the best mixes and how you can keep your class motivated from start to finish with the right tunes. When you’re ready to book The DJ Firm for your class or special studio events, he’ll show you just what he can do with music, lights – the whole shebang. Class will cost just $5 with all ticket sales benefitting the Greater Chicago Food depository. We’ll start with the workout from 1-2 pm then we’ll take on the DJ workshop from 2-3 pm. If you can only make it to the panel, there’s a separate ticket type for that. Can I come to just the workshop portion? Yes! There are two ticket types, one for the workout and workshop and one for just the workshop. Where do I get tickets? Grab them below! What Should You Know About Doing Your Taxes if You Work For Yourself?